You know I can't go past a good stamp...I liked that the design of this one was simple and would probably fit into an old-school steampunk OR modern minimalistic project...by Brown Pigeon. Added bonus, comes with the little cloud stamp as well! 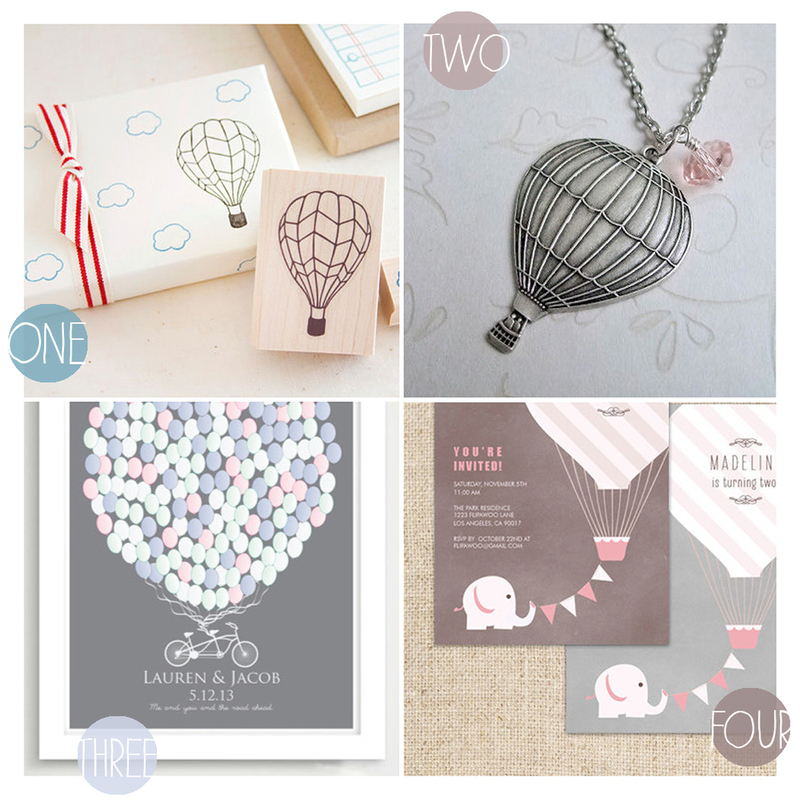 This whimsical hot air balloon necklace is by Vintage & Glam. An alternative to the wedding guest book, this 20 x 30 print includes 200 balloons for signatures and a sweet tandem bike to anchor them. With heaps of variations on designs and colour combinations, check out Leaves & Honey's store. These customizable/printable invitations would be gorgeous to design an event around...I'm loving the pink and grey colour combo....by Flipawoo. This retro handmade linen cushion cover is by Linxge. Lazydoll makes sweet little purses designed to protect your smartphone when travelling. Lastly, these wooden gift tags come in a set of three different designs made from maple wood, by Clear Cat. As it turns out, my own Pinterest boards had a fair few balloons in them already...I guess I must be subconsciously drawn towards them :) One was my inspiration for the lace balloons that didnt quite work out as planned for the vintage bridal shower. Two is a mixed media piece called 'Floating Away' by Piland, Walton, Bliss & James. Three is by My Lovely Thing & might just be my favourite thing ever...there's my addiction to pink and grey showing through again! Four is by Eye Poetry Photography...who is currently on a break but travelling to take more photos, can't wait to see what they come back with as I was pretty much obsessed with everything in this Etsy store! 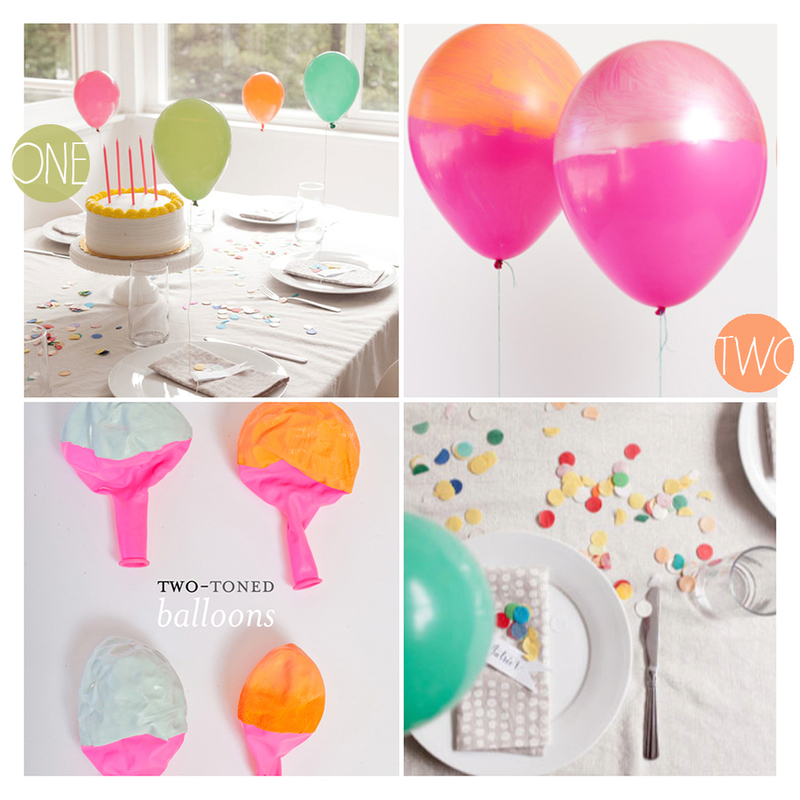 These were two very simple but deliciously effective balloon DIY's that I had favourited in my blog feeds awhile back. One is O Happy Day using miniature balloons as part of place settings for a party. Miniature balloons just take me straight back to the days of water bomb fights in summer. This idea is so simple but effective. Two is by Subtle Revelry...acrylic paint on balloons. The metallic with the hot pink is just gorgeous...and I love that the brush strokes are visible and the lines uneven...I am so doing this next time I have something I can use balloons for :) You could get a lovely ombre effect using this technique too I would imagine! Lastly, I know this is old school but I'm transfixed by it every time I come across it. The Schweppes Burst Ad...the soundtrack is `To Build A Home' by The Cinematic Orchestra...love.